Angels are traditionally placed at the top of Christmas trees to represent their role in the birth of Jesus. Several angels appear in the biblical story of the first Christmas. Gabriel, the archangel of revelation, informs the Virgin Mary that she will be the mother of Jesus. An angel visits Joseph in a dream to tell him that he will serve as Jesus's father on Earth. And angels appear in the sky over Bethlehem to announce and celebrate Jesus's birth. It's that last part of the story—the angels appearing high above the Earth—that offers the clearest explanation for why angels are placed at the top of Christmas trees. Evergreen trees were pagan symbols of life for centuries before Christians adopted them as Christmas decorations. Ancient people prayed and worshiped outside among evergreens and decorated their homes with evergreen branches during the winter months. After the Roman Emperor Constantine selected December 25 as the date to celebrate Christmas, the holiday fell during winter for all of Europe. It made sense that Christians would adopt regional pagan rituals associated with winter to celebrate the holiday. In the Middle Ages, Christians began decorating "Paradise Trees" that symbolized the Tree of Life in the Garden of Eden. They hung fruit from tree branches to represent the biblical story of the fall of Adam and Eve and hung wafers made from pastry to represent the Christian ritual of communion. The first time in recorded history that a tree was decorated specifically to celebrate Christmas was in Latvia in 1510, when people placed roses on the branches of a fir tree. The tradition quickly gained popularity, and people began to decorate Christmas trees in churches, town squares, and their homes with other natural materials such as fruit and nuts, as well as with cookies baked in a variety of shapes, including angels. Christians eventually took up the practice of placing angel figures at the top of their Christmas trees to symbolize the significance of the angels who appeared over Bethlehem to announce Jesus's birth. 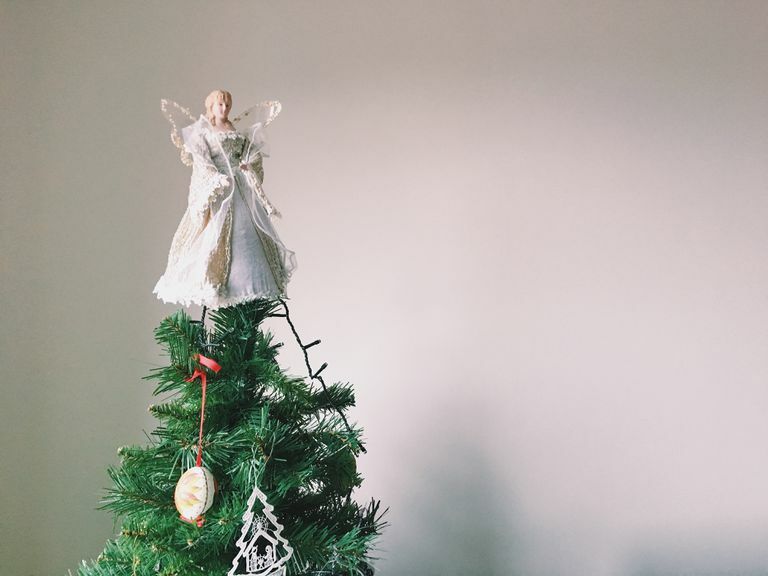 If they didn't use an angel ornament as a tree topper, they usually used a star. According to the biblical story of Christmas, a bright star appeared in the sky to guide people to Jesus's birthplace. By placing angels at the top of their Christmas trees, some Christians were also making a statement of faith intended to scare evil spirits away from their homes. After Christians began decorating Christmas trees, they would sometimes pretend that angels were actually the ones decorating the trees. This was a way of making the Christmas festivities fun for children. People wrapped paper streamers around the trees and told children that the streamers were pieces of angel hair that had been caught in the branches when the angels leaned in too closely while decorating. Later, after people figured out how to hammer out silver (and then aluminum) to produce shiny streamers called tinsel, they used it on their Christmas trees to represent angel hair. The first angel ornaments were handmade ones, such as angel-shaped cookies or angel ornaments fashioned out of natural materials like straw. By the 1800s, glassblowers in Germany were making glass Christmas ornaments, and glass angels began to adorn many Christmas trees throughout the world. After the Industrial Revolution made it possible to mass produce Christmas ornaments, many different styles of angel ornaments were sold in large department stores. Angels remain popular Christmas tree decorations today. High-tech angel ornaments implanted with microchips (which enable the angels to glow from within, sing, dance, talk, and play trumpets) are now widely available.